It's that time again! 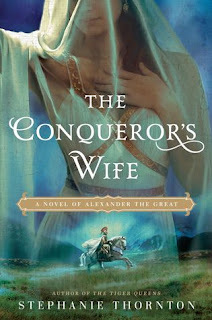 Flashlight Commentary is pleased to offer fans of historic fiction a chance to win a free edition of The Conqueror's Wife: A Novel of Alexander the Great by Stephanie Thornton! Stephanie Thornton is a writer and history teacher who has been obsessed with infamous women from ancient history since she was twelve. 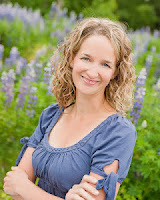 She lives with her husband and daughter in Alaska, where she is at work on her next novel. "The Secret History: A Novel of Empress Theodora," "Daughter of the Gods: A Novel of Ancient Egypt," and "The Tiger Queens: The Women of Genghis Khan" are available now. "The Conqueror's Wife: A Novel of Alexander the Great" will hit the shelves in December 2015. Britannia: land of mist and magic clinging to the western edge of the Roman Empire. A red-haired queen named Boudica led her people in a desperate rebellion against the might of Rome, an epic struggle destined to consume heroes and cowards, young and old, Roman and Celt... and these are their stories. A calculating queen sees the sparks of revolt in a king’s death. 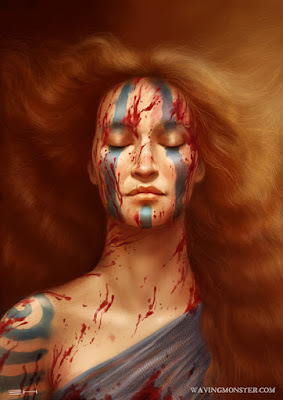 A neglected slave girl seizes her own courage as Boudica calls for war. An idealistic tribune finds manhood in a brutal baptism of blood and slaughter. A conflicted warrior hovers between loyalty to tribe and loyalty to Rome. A death-haunted Druid challenges the gods themselves to ensure victory for his people. An old champion struggles for everlasting glory in the final battle against the legions. A fiery princess fights to salvage the pieces of her mother’s dream as the ravens circle. A novel in seven parts, overlapping stories of warriors and peacemakers, queens and slaves, Romans and Celts who cross paths during Boudica’s epic rebellion. But who will survive to see the dawn of a new Britannia, and who will fall to feed the ravens? Historically speaking, anthologies haven’t worked well for me, but books like Grand Central and A Day of Fire have slowly changed my opinion of the format. I wouldn’t consider myself a true fan just yet, but I’m not outright opposed that’s saying something considering past experiences. Though a novel in an of itself, the book is structured with the reader in mind. Should any section fail to interest, the audience is free to move ahead without losing the primary story line. I personally wouldn't recommend it as each section has certain merits, but I appreciate the effort put into the construction of the novel just the same. Much like A Day of Fire, A Year of Ravens centers on a particular noteworthy event. The stories featured in the anthology are set against Boudica’s Rebellion and while I’ve seen the drama fictionalized before, I couldn’t help appreciating how these seven authors captured it from so many uniquely diverse points of view. Each contribution is characterized by the author's individual style, but each is linked by both characters and contents. The end result is as multifaceted and varied as the writers themselves. Violent and striking, this is not a story for those opposed to brutality and bloodshed, but that said, I found it exceptionally well-drawn and historically satisfying. I had trouble with Dray’s contribution, but please, hear me out before you jump to any conclusions. The short features Queen Cartimandua and illustrates rising tensions between the tribes and the Romans. It’s informative, emotional and engaging. Problem is, Dray’s interpretation of Cartimandua is a force in and of herself, she’s worthy of more than the few pages she receives here and I was genuine frustrated at not being able it indulge in more of her story as written by this particular writer. Ruthie Downie was a new author for me, but one I greatly enjoyed getting to know through her contribution to this anthology. Her style and tone drew me immediately into Ria’s story and I was quickly lost in the experiences of the all but invisible slave girl. Ria circumstances give her a unique perspective of the royal family and I liked the contrast it created in the fabric of the novel. Ria’s emotional journey is also worth mentioning as it’s probably one of the most complex of the entire book. 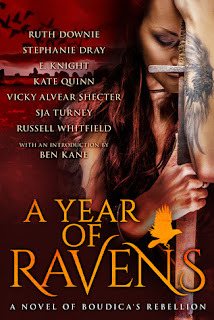 Russell Whitfield is an author I’ve wanted to read for quite some time, but his contribution to A Year of Ravens marks my first experience with his work and it was definitely worth the wait. Agricola proved an interesting narrator for a number of reasons and his journey to the island of Mona marked one of the high points of the collection. His story felt more drawn out than the other contributions, but I ultimately enjoyed where Whitfield took his contribution and the themes he highlighted in it. Nothing I say about Vicky Alvear Shecter’s The Druid will do it justice. I’ve read the author before, but the drama she created for Yorath and Felix literally sent chills down my spine. I enjoyed each of the preceding stories for different reasons, but this selection jumped from the page and took hold in way the others hadn’t. I hate sounding like a gushing fan girl, but I loved everything about this short and am not shy to admit it my favorite of the anthology. S.J.A. Turney was another new author for me which is funny as his story features Andecarus, a character who first caught my eye in Ruth Downie’s The Slave. I went into both pieces not knowing what to expect, but found both satisfying in their way. Turney’s interpretation of Andecarus is both compelling and thought-provoking and I enjoyed the perspective he captured in someone who felt divided loyalties during the conflict. I’m almost afraid to comment on Kate Quinn’s contribution. I’ve never made any secret of my appreciation for her work and while I try to remain objective in my analysis, I’d like to point out that it isn’t my fault that she keeps hitting the ball out of the park. Her illustrations of both Duro and Valeria had me hooked from page one, but it was the way the story drew the others together that stands out in my mind. The other stories linked here or there, but I felt this particular effort was the most comprehensive of the book. I love E. Knight’s work and looked forward to it when I first picked up the book, but I’d be lying if I didn’t admit my enthusiasm for The Daughters grew over the course of the book. Keena and Sorcha dance in and out of the other stories. They tease the reader and of all the characters, I felt it apropos that theirs be the last installment of the anthology. Knight’s interpretation is powerfully drawn and stands as a commanding and poignant footnote to the epic battle that inspired all seven authors to put pen to paper. She calls herself Ash, but that's not her real name. She is a farmer's faithful wife, but she has left her husband to don the uniform of a Union soldier in the Civil War. Neverhome tells the harrowing story of Ash Thompson during the battle for the South. Through bloodshed and hysteria and heartbreak, she becomes a hero, a folk legend, a madwoman and a traitor to the American cause. 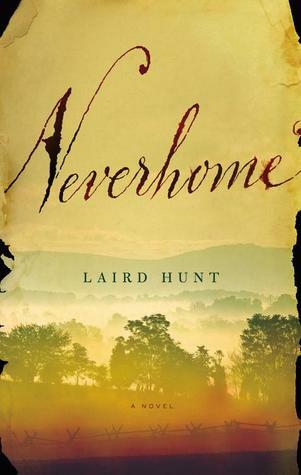 Laird Hunt's dazzling new novel throws a light on the adventurous women who chose to fight instead of stay behind. It is also a mystery story: why did Ash leave and her husband stay? Why can she not return? What will she have to go through to make it back home? In gorgeous prose, Hunt's rebellious young heroine fights her way through history, and back home to her husband, and finally into our hearts. Laird Hunt’s Neverhome has received much acclaim and that is wonderful, but that said, I feel the time I spent on the book well and truly wasted. My apologies to fans of both the author and his work, but I found very little of this narrative appealed to my particular tastes. Personally, I found it very difficult to relate to Ash and had a hard time manufacturing empathy for her trials and circumstances. To be perfectly honest, I didn’t care if she survived her journey home and that fact made it impossible to appreciate the hurdles she faced over the course of the narrative. Hunt’s tone is dark and ultimately rather depressing and while I’ve nothing against his style or themes, I can’t say his effort packed the punch I’d anticipated. To be perfectly blunt, I felt the pacing slow, the action monotonous and the ending abrupt and uninspired. At the end of the day, I’m definitely disappointed at having wasted my time on Neverhome. There was a lot of potential in the idea, but I don’t think Hunt rose to the occasion and wont be recommending it forward. That was something to think about. How you could rifle a man down was looking at you and you at him but never see his face. I hadn’t figured it that way when I had thought on it back home. I had figured it would be fine big faces firing back and forth at each other, not threads of color off at the horizon. A dance of men and not just their musket balls. As small children, Rudyard Kipling and his sister Trix lived an enchanted life in India playing with their beloved servants and running around freely. Their innocent happiness came to an abrupt end when they were sent back to England to live with strangers and forced to conform to the strict rules of Edwardian society in an alien country. Both brother and sister grew up to become writers, although one lived in the shadow of the other's genius. Rudyard Kipling's incredible life is known to many while his poetry and books have been read by millions â€“ but what became of his talented younger sister? Her story, full of love and lies, became a distressing family secret that was hidden from the world... Mary Hamer has unearthed the truth about Alice Kipling, known to her family affectionately as Trix. In this fictionalised account of their lives, the author goes to the heart of the relationship between a difficult brother and his troubled sister and explores how their early lives shaped the very different people they were later to become. 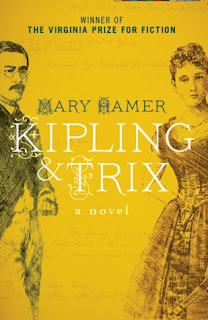 Biographic fiction is quickly becoming one of my favorite genres, so I assumed Mary Hamer's Kipling and Trix would be something of a slam dunk. Based on the early lives of the famed writer and his younger sister Alice, the prize winning fiction held much promise, but the realities failed to meet my expectations, I feel the time I gave to this piece misspent. To get right to the point, Hamer's handling of the material left much to be desired. Her characterizations fell flat and the novel's tone was far too academic for my tastes. The pacing drags throughout the telling and I found it incredibly difficult to engage in the story Hamer put forth. The research is well-done, Hamer obviously cares a great deal for the material, but her style and approach didn’t inspire my imagination and I found it very easy to put the book aside for other publications. I managed to push through to the end, but the story never pulled me in. At the end of the day, I found the material in Kipling and Trix historically interesting, but I didn’t care for the narration and would have a hard time recommending it forward. Then, almost the very next week, Ruddy published that really quite scurrilous attack on Roberts. Lockwood was not confident in his own mind that he knew how to account for his son’s behaviour. Terms like ‘integrity’ or ‘the duty of a journalist’ did not quite seem to fit the case. 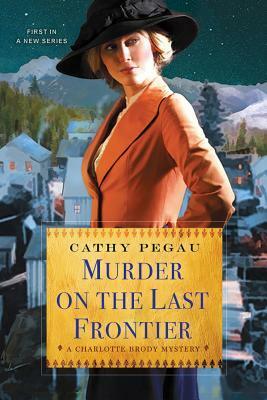 My first thought on seeing Cathy Pegau’s Murder on the Last Frontier was to run as fast as I could in the opposite direction. I mean absolutely no offense to the author, but the last Alaskan fiction I attempted scarred me for life and reviving the memory wasn’t high on my to-do list. Still, something about the premise piqued my interest and to make a long story short, I bit the bullet, quashed my doubts, and put in for a review copy. I guess I should start by saying that I found Charlotte Brody a fascinating heroine. She is a feminist and a suffragette, but she doesn’t pontificate. She lives by her beliefs and I found the subtly of her character inviting. I was also struck by her opinion of the working girls of Cordova. Her thoughts may be described as modern, but I appreciated them because they felt appropriate to someone in Charlotte’s situation. Charlotte’s brother Michael was equally interesting and I loved backstory Pegau created for him. Many of the characters have come to Cordova in search of a fresh start, but the Michael’s motivations felt incredibly authentic and I liked the history perspective his circumstances afforded. James’ role as Charlotte’s love interest was predictable, but I think the way Pegau played it genuinely realistic. The two don’t fall into one another’s arms and declare their undying affection and I liked that. These characters have emotional baggage they’re struggling to rectify and I thought their hesitancy and caution both refreshing and original. The mystery itself is not overly complex, but it is engaging nonetheless. I felt invested in the plot despite accurately identifying the culprit and I enjoyed the atmospheric quality of the narrative Pagau put forth. Delightfully entertaining and authentically written. A highly recommended historic mystery. Retreating into her room, she pushed her door closed and leaned her forehead against the cool wood. Not even twenty-four hours in town and she’d twice been mistaken for a sporting woman. A wry laugh escaped her throat. Surely that was some sort of record. Living on her family’s idyllic lakeside estate in Cornwall, England, Alice Edevane is a bright, inquisitive, innocent, and precociously talented sixteen-year-old who loves to write stories. But the mysteries she pens are no match for the one her family is about to endure… One midsummer’s eve, after a beautiful party drawing hundreds of guests to the estate has ended, the Edevanes discover that their youngest child, eleven-month-old Theo, has vanished without a trace. What follows is a tragedy that tears the family apart in ways they never imagined. Decades later, Alice is living in London, having enjoyed a long successful career as an author. Theo’s case has never been solved, though Alice still harbors a suspicion as to the culprit. Miles away, Sadie Sparrow, a young detective in the London police force, is staying at her grandfather’s house in Cornwall. While out walking one day, she stumbles upon the old estate—now crumbling and covered with vines, clearly abandoned long ago. Her curiosity is sparked, setting off a series of events that will bring her and Alice together and reveal shocking truths about a past long gone...yet more present than ever. A lush, atmospheric tale of intertwined destinies, this latest novel from a masterful storyteller is an enthralling, thoroughly satisfying read. 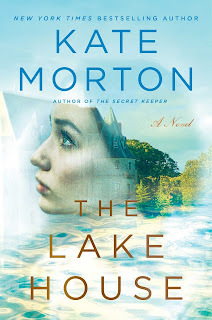 I had no idea what I was getting myself into when I picked up Kate Morton’s The Lake House. I’d never read the author before and truth be told, I signed on to tour the book without thinking the decision through. I probably shouldn’t admit this, but I didn’t even read the blurb until I was halfway through chapter two. I know it sounds like a recipe for disaster. I cringe just reading it, but luck favored me this go round and I ended up really enjoying the story I stumbled into. I had no expectations and I was flying blind when I cracked it open, but I fell for Morton’s writing from the start and couldn’t help getting lost in the narrative she created. Strictly speaking, the themes of the novel were a little softer than my usual fare, but I appreciated the situational drama and enjoyed the tension and mystery Morton crafted around her cast. The loss of a child is a devastating concept, but I felt the way Morton portrayed the emotional repercussions of the tragedy on each member of the Edevane household exceptionally imaginative. The story twists and turns in unexpected ways, but Morton’s ability to convincingly pull the various story lines together is truly astounding. Rich in spectacle and suspense, The Lake House proved surprisingly satisfying. A highly recommended read. She didn’t know it then, but she would never be rid of them, those sounds; they would follow her from this place, this time, invading her dreams and nightmares, reminding her always of what she had done.